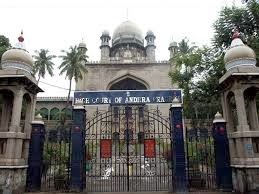 The Andhra Pradesh High Court is the High Court of the Indian state of Andhra Pradesh. It was set up on 5 November 1956 under the state reorganization act 1956. The Plan of the High Court was drawn up by Shankar Lal of Jaipur and the local engineer who executed the design was Mehar Ali Fazil. The construction started on 15 April 1915 and was completed on 31 March 1919. On 20 April 1920 the High Court building was inaugurated by Nizam VII Mir Osman Ali Khan. While digging the foundation for the High Court, ruins of the Qutb Shahi Palaces, namely Hina Mahal and Nadi Mahal were unearthed. The High Court looks beautiful and impressive from the Naya Pul Bridge at sunset. After its construction, a silver model of the High Court with a silver key was presented to the Nizam VII Mir Osman Ali Khan by the Judiciary during the Silver Jubilee Celebrations in 1936. The facsimile of the buildings was perfectly carved in a thick sheet of silver weighing about 300 kg. The model is now in the Nizam's Museum in Purani Haveli.When the High Court of Andhra Pradesh was formed in 1956 as a consequence of States Reorganisation Act, the Judges strength was increased to 12. 1.Hon'ble The Chief Justice Nawab Alam yar jung Bahadur.